Vivien Bower, a long time client of Axis Sports Medicine, is a huge inspiration to us here at Axis Sports Medicine. Like many in Summit County, Vivien grew up on the East Coast, in New Jersey. As a lifelong skier, the mountains of Colorado always had a special allure for her. In 2001, Vivien and her husband took a leave of absence from their jobs and spent 6 weeks exploring Summit County, which got her hooked on #mountainlife. They returned frequently, and were overjoyed to become part-time residents in Silverthorne in 2006. They finally moved out to Colorado full-time in 2018. Of course, living at 9,000 ft hasn’t gotten easier as Vivien has aged, and she now sleeps with oxygen at night. But, Vivien has never let her age slow her down. She has been an active person her whole life and can usually be found outside, because she “hates being cooped up indoors.” At 77, she walks or hikes every day, even when it’s icy and cold out. She’s an avid downhill and nordic skier as well, and loves skiing the popular Salt Lick trail, near Wildernest. With her active lifestyle, Vivien has had her share of injuries. She’s been seeing Ami and the physical therapy team at Axis since we opened in 2012. In fact, Vivien followed Ami from another practice to Axis. Vivien claims she’s “kept Axis in business” over the years, receiving care for knee and shoulder injuries, 3 back surgeries, and she even took her husband to Axis for physical therapy after a hip replacement. She’s always felt the therapists at Axis are the best out there. (We agree!) We encourage her to get out and keep doing what she loves to do and they provide a very personal experience for her. She even brings her dog by to say hello on their walks! While Vivien has overcome injuries in the past, she faced her biggest recovery just last year. On February 2nd, 2018, she was downhill skiing in bad snow conditions. According to Vivien, “I was probably going a little too fast and I caught an edge. Down I went.” The snow was hard-packed like cement that day, and the fall was serious. Ski patrol brought her to the medical center in a sled, and discovered she had multiple fractures, including her pelvis and sacrum, as well as substantial internal bleeding. A few days after the fall, sciatica nerve pain kicked in, which is extremely painful. She had to have surgery, to remove metal hardware from an earlier back injury, just so she could have an MRI after the fall! The MRI revealed more fractures and the cause of the sciatica pain. After the accident, Vivien was off her feet for 3 months and faced major full-body rehab. As Vivien says, “When you injure yourself when you’re older, you are also older when you recover and restart activity.” She knew she faced a long and challenging road to recovery. 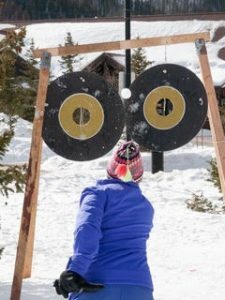 While she decided she was done with downhill skiing after her injury, she still wanted to be able to cross-country ski. 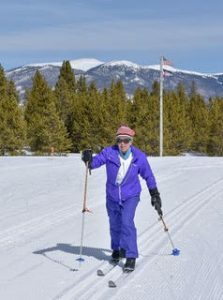 Vivien had participated in the annual Summit County 50+ Winter Games, way back in 2004. Back then, she felt like the events were too competitive and she felt too nervous to have much fun. She decided volunteering would be more fun for her, so she volunteered at the event off and on over the years, enjoying the atmosphere and camaraderie. Then in 2017, she decided to give the nordic ski events, including the biathlon, another try, just to join in and have fun. She overcame her nerves and loved it the second time around! 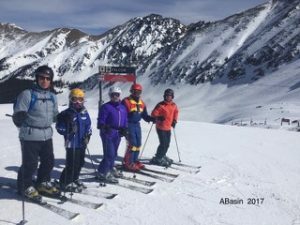 After her big skiing accident, Vivien was on a slow road to recovery, with the help of the physical therapy staff at Axis, in Silverthorne. She worked hard at her recovery and was feeling stronger by the time winter rolled around. 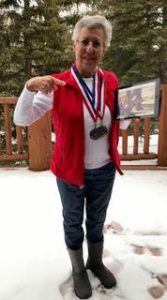 She told her physical therapy team that she wanted to compete again in the 50+ Winter Games in February, thinking they would tell her “no.” Of course, her therapists were, in fact, thrilled and supportive and worked to help her get ready for the nordic events. Vivien entered the 2.5k classic race, the biathlon, and the always-popular snowball toss. The first race was the 2.5k classic ski, and Vivien recounts, “It was a little bit of a competitive atmosphere, but I made it to the end! I started out too fast, so was out of breath and I had to stop in my tracks for a moment. When I restarted, I followed someone ahead of me who went the wrong way. It ended up being a shortcut and I was disqualified.” But Vivien didn’t let a bad first event get to her! Not one to be deterred, Vivien went to her next event and did much better. 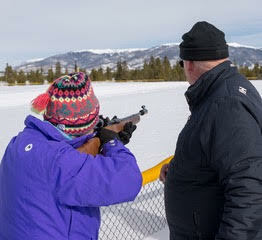 She says, “The biathlon was fun. It’s a shorter distance and they show you how to shoot the gun. You get four shots at a target, and you know when you hit it because you hear the ping! 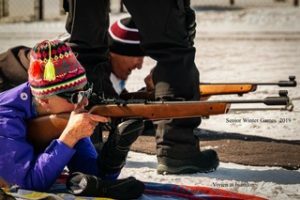 I had shot rifles two years ago when I competed in biathlon, but otherwise hadn’t shot a rifle since I was 13.” Well Vivien had an amazing performance and claimed not one, but TWO silver medals, in the biathlon and the snowball toss. 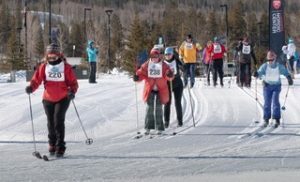 Vivien is, of course, very modest and says “Well, there was only one other person in my age group, so the whole thing is silly,” but in reality, there’s not a whole lot of 77-year old ladies who are even capable of getting out and competing in nordic ski races! There’s even fewer 77-year old ladies who would compete exactly one year after a horrific accident left her bedridden. The fact that she was even out there competing was amazing in itself and we are so happy for her success and tenacity! Vivien says she is most proud of “just getting out and doing it. I felt so out of shape, but I knew why. It takes a long time to get back in shape when you are stuck in bed for months. When you are injured that happens. You are never 100% the same as before the injury, but you CAN still do what you want to do.” When we asked what advice she would give to others who are thinking about participating in next year’s 50+ Winter Games, Vivien said, “The more people who do it, the more fun it is! Do it!” What an inspiration to all of us. She is still working on her accident recovery with Axis, but she looks forward to competing in the games again next winter, and feeling stronger this time. We can’t wait to watch her get out there again next year and #kickaxis. Absolutely fantastic and inspiring. What a comeback. Keep going!! !